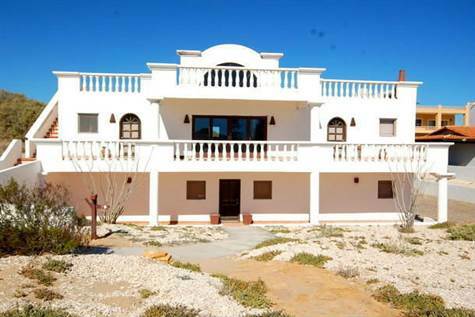 Las Conchas, Puerto Penasco/Rocky Point – Panoramic ocean view home in the popular Las Conchas gated community by the sea. The margarita deck is outstanding for capturing the stunning sunsets and vibrant evening sky. A large open great room floor plan is excellent for family gatherings and fun evenings with friends. The beautiful boveda ceiling throughout the living area, dining and kitchen gives you a very inviting setting. There’s also a game room with pool table for all to enjoy. It has 3 bedrooms and 3 bathrooms with Saltillo tile throughout. The master bedroom has a cozy reading area, vanity table with sink and a large adjoining bathroom. The other two bedrooms share a full bath and both have a vanity table and sink.